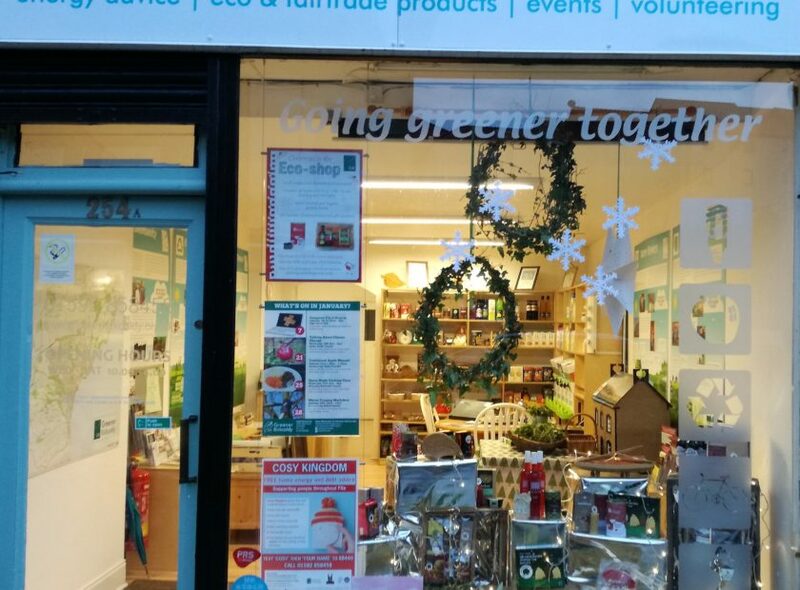 The ‘Greener Kirkcaldy High Street Hub’ is home to our Eco Shop, which sells a range of green, organic and Fairtrade products, and is also a welcoming space to come for energy advice, a chat about volunteering opportunities, or just to find out more about what we do. The Hub is at 254a High Street (at the foot of Oswald’s Wynd), Kirkcaldy. It’s open Wednesdays to Saturdays 10 til 4. We hold regular workshops and events in the Hub – such as swapshops, film showings and crafty upcycling sessions. See upcoming events on our Events page. You can also sign up to Greener Kirkcaldy’s other events at the Hub, join our growing team of volunteers or become a member of Greener Kirkcaldy. As a Member, you receive a discount in our all Eco products, get invited to special events and can help us shape the work we do. Our energy advice service has helped thousands of local people reduce their energy bills, as well as making their homes warmer and cosier. Anyone can pop into the High Street Hub for a chat with one of our qualified energy advisors or contact us to arrange an energy advice visit at home. The Hub has a wide range of Eco and Fairtrade products in stock, including products from local suppliers, gluten-free, organic and vegan groceries and a new line in energy saving products such as LED light bulbs and electricity meter monitors. Our Ecover cleaning products and refills are available from handy dispensers, making it even easier for you to reuse and refill your empty Ecover bottles. You’re sure to find something to help you go greener! For more details about current products and promotions, see our Eco Shop page. We want to bring more good, local and ethical food to Fife tables. Order a bespoke grocery box every fortnight, filled with your choice of locally-grown, seasonal fruit, veg, herbs, ethically-sourced wholefoods and other essential groceries through our Eco Shop with our Fife Food for Fife Folk project. Why buy when you can borrow? Borrow DIY and gardening tools and equipment for free from our High Street Hub with our Library of Things project. Whatever your reason for coming in we are happy to help and talk you through what we do and what we offer.